Peter Levine’s work in trauma is grounded in medical biophysics, psychophysiology, and psychology, as well as his own innovative research into the instinctual behavior of wild animals. Over the past 35 years, he has developed and refined a method called Somatic Experiencing (SE), which provides the foundation for this guide to dealing with trauma in children. At the core of this book is the understanding that trauma begets violence, and violence begets trauma. The effects of trauma can result not only from catastrophic events such as abuse and violence but from everyday, common incidents such as minor auto accidents, routine medical procedures, family stresses, even something as seemingly innocent as falling off a bicycle. Trauma Through a Child's Eyes offers a hopeful alternative to children acting “in” (on themselves) or “out” (on others) in response to pain and injury. 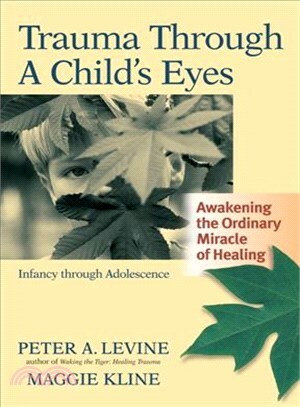 Most children possess an innate natural resiliency, and Levine explains how adults can help them tap into and strengthen that resiliency to resolve the effects of trauma and cope successfully with future harmful situations. Dr. Peter A. Levine, author of the best-selling Waking the Tiger and of Healing Trauma, has a background in medical biophysics, stress, and psychology. He developed Somatic ExperiencingR, and serves as a consultant to the Meadows, a leading residential addiction recovery center. He lives on the banks of the St. Vrain River in the Rocky Mountains.